The American Printing House for the Blind (APH) and the Dollywood Foundation are pleased to announce a partnership that will expand the “Imagination Library” program to provide blind and visually impaired children with accessible books. The Imagination Library is a program that has put more than 34 million free books in the hands of children age 5 and under, and thanks to the collaboration with APH, a selection of those books will be translated into braille and audio recordings. The announcement coincided with Dollywood’s annual summertime KidsFest celebration, where Dolly Parton and representatives from APH presented a Braille book to Cameron Burkett from McMinnville, TN. Among Parton’s most passionate humanitarian efforts is her commitment to encourage a love of reading among preschool children and their families through her Imagination Library. The Dollywood Foundation will work with the American Printing House for the Blind to select several book titles each year that are suitable for reproduction in braille and audio. The program will begin by making audio files available, for free, to Imagination Library participants from a link on APH’s website by September of 2011, and more than 35 titles will be available by the end of this year. Later, the partnership will also make available an annual selection of print/braille Imagination Library books that can be purchased from APH at low cost. Bradley Burkett (dad), Dolly Parton, APH's Suzette Wright and Gary Mudd (with Denver), and Cameron Burkett. Check out this new webpage and learn the latest on this exciting new literacy partnership, including a video of the partnership announcement with Dolly Parton, Foundation President David Dotson and APH’s Gary Mudd at Dollywood! APH/Dolly Parton's Imagination Library Partnership Launched! The first DPIL audio book files are now available at the site as free downloads to registered National Library Service (NLS) members. Audio books will be added each month until most of the 75 titles in the DPIL collection are available to children and their families. Beginning in 2012, the Partnership will make available an annual selection of print/braille Imagination Library books free to eligible families and for purchase at low cost to all others (regular funds or Federal Quota funds can be used). 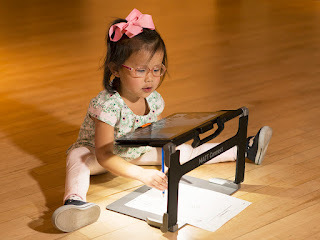 We're very excited that APH's partnership with DPIL not only expands the number of accessible books for young children, but also connects families to a wide range of resources that will enable them to locate and bring more accessible books into their home.